This page is for suggestions of minor improvements to cycling provision in and around Ely. Minor improvements could be a dropped kerb, removing a barrier, some additional cycle parking, etc. If you have a suggestion leave a comment at the bottom of the page and we’ll add it to the list and mark it on the map. Suggestion: Clarify access on path from St Johns Road to Cambridge Road via Tower Court. Signage says no cycling, but it appears on the new cycle map as a cycle route. Added it to the list and map. I would much welcome removal of the cobbles on the ramps on the speed tables in Silver Street, Barton Square, and The Gallery (or at least the provision of a section on the left part of each ramp which has a smooth surface). Take away the parking spaces on Kings Avenue (Cathedral view/Barratt development) where they currently have strips of cycle lanes that end in parking spaces. There should be a cycle lane all the way along or not at all. The current situation is impossible to use as if you cycled on the path you would crash into the back of parked cars. They have painted parking spaces with the cycle path either side, the idea being to stop the cars from parking on the cycle path but actually allocating spaces. In effect, on the cycle path was as good as letting down the tyres of the cyclists trying to use the path. People rarely park on the older part of kings avenue whereas on the new development residents park on the road rather than bothering to drive round the back of where they live or don’t instruct visitors where to park. The way the development was designed there should be no parking along Kings Avenue but now it’s dangerous to drive or cycle because of the number of parked cars blocking your way. Restore the now almost nearly lost red cycle ‘strip’ on the corner, coming from the roundabout on the A142 (N corner of Tesco car park) into Station Road, between Gas Lane and Annesdale. Making this a clear cycle path (dotted line, though, so cars can still use this as well) may help prevent stupid car drivers thinking they can overtake in that corner whilst from the other side a double line of cars is forming – just needs one wide 4×4 or a truck amongst these to get you as a cyclist squashed between a car and the kerb. Where you put it is a separate one, which would of course also be useful. Where I meant was on the station forecourt, the east-west ‘station entry road’ parallel to Tesco’s car park (southern side). Having a red cycle lane here of minimal 2 m wide on the Tesco side of the road (probably starting where the second, easternmost pedestrian cut through is to the Tesco car park) would help the traffic flow going out of the station at peak afternoon times. With the cycle lane then continuing all the way to the roundabout with the A142 would be even better – then car drivers should be less likely to cut cyclists off who want to go straight ahead into Back Hill, whereas most cars turn left into the A142. If all of this could be arranged, it then also needs a big red cycle advance box (or whatever these are called) at the roundabout, so it should be even clearer for car drivers that many cyclists will want to go straight ahead. On Back Hill (coming from the station), create a bright (red?) coloured cycle strip between just before Potters Lane and beyond Broad Street. Especially since Sainsbury’s is in operation, a lot more traffic goes right here than before. This means that, as a cyclist you want to go straighta ahead, one is waiting behind cars for nothing. There would be space for cycilsts to pass on the left-hand side, if all cars queue up along the central line. Creating a clear ccyle path here might actually ensure cars do just that. Silver Street, just W of Church Lane (opp. the pub): here is the small pedestrianised connection to the car park. I use this in the morning to go to the station – only alternative if you do not want to go illegally conra-flow through Silver Street. Added, does it also have an annoying barrier? Riverside, next to the pub, just N of Victoria Street: there is a narrowish connecting stretch parallel to the pub’s car park, connecting the riverside with Jubilee Terrace. This is on the NCN11 route, BUT there is a sign ‘no cycling’ here. It is narrow, but wide enough I think to allow cyclists – could this not be replaced with a different sign, allowing people to cycle through, but giving way to pedestrians when needed (similar to signs along the waterside, under and near the railbridge, a bit further south). Also, I have never come across a pedestrian here whilst cycling trough, so this sign seems unnecessary anyway. Cathedral: the path going around its eastern side; between the car park to the cathedral’s south entrance and the gates into the High Street: I know cars drive through here regularly to park near the public toilets; it is however, not clear whether cyclists are allowed – I assume they are. It would be good to have some signage on either end, explaining the situation. This would ensure that pedestrians may make more effort to give some space (after repeatedly ringing the bell, still delibrately ignoring you, as they think you should not be there may then be a thing of the past). Of course, through the gate into High Street, people should give way to pedestrians, and probably even come off their bikes. The rest should be cyclable though. Yes, absolutely.There is of course the issue that the gate at the High Street end of this route gets locked at 6:30 each night. Not quite sure why that is, I assume some old ‘safety’ issue for the King’s School? Perhaps the timing of closing could be reconsidered as well? The path aound the back of the Catherdral is open to cyclists. It is owned by the Dean & Chapter who are not keen on having it signed as a cycle route. Sustrans asked as it was the sensible way to get into Ely city centre from NCN 11 heading North, but permission was refused. It is also Dean & Chapter who have control of the Sacerists gate locking. That’s already on the list. Added, there are even small kerb stones that lead into the driveways crossing the path. Where Lisle Lane changes into Forehill, on the sharp corner with Waterside: the on-road cycle strip they made with S106 monies from the Sainsbury devlopment is generally fine, except in this corner. Today I got nearly crushed by a car coming out of Waterside and stopping too late, thus having the front of the car way into the road already, entirely covering the cycle lane. I came from Sainsbury’s way, folowing the main road into Forehill. At the same time there was a car trying to overtake me in this sharp corner. The problem here is that the cyclepath drastically narrows IN THE CORNER! and then disappears 3 metres further altogether. Clearly a job done from the laptop by someone who does not cycle… This creates a dangerous situation. SOLUTION: widen the cyclelane to teh same width as on teh rest of Lisle Lane and extend further towards the NW. Plus create a big wide arrow on the road indicating taht cyclists will move into the centre of the lane, thereby making it clear to cars that they should not overtake in this corner. Added, that whole junction is a classic case of tokenism towards cycling in my opinion. It needs to be totally rethought. Although possibly already covered with the ‘allow cycling allong the river’ blue pin, it seems to me that it is already allowed on the stretch between the tea room, past the Babylon gallery until the Pocket Park car park. Again, signage is the real issue here: make it clear what is and what is not allowed. Suggestion: shared pedestrian/cyclists path, with ‘cyclists give way’ sign added. Arguably the bit around the galery cyclists should dismount, but a ‘give way’ sign should hopefully be enough. Pocket Park car park: the formerly very muddy car park for the Pocket Park has now thankfully got a hard surface. However, it has since also become busier here, with more cars going in and out of the car park. As a pedestrian/cyclists one does not feel 100% safe crossing the car park from one end to the other, from the end of Willow Walk/path alongside the river to the Pocket Park itself. A simple and low-cost solution would be to add a thin layer of dust/gravel/etc along the western side of the car park in a bright colour, distinct from the dark grey surface it has now- at least 2.5 m wide, and have it rolled into the surface. Make this a shared two-way path. This would make pedestrians and cyclists feel safer, and make it clearer to cars leaving and entering to look out for vulnerable road users. Forgot to add: at the entrance point to the car park (from the Willow Walk) there should also be a 10 mile/hr speed limit sign! Connect Willows Grove with Creswells Lane (ca. opp. new Sainsbury’s entrance point). There is a small bit of scrub/woodland here (don’t know who owns it; possibly a governmental organisation, perhaps part of the water recyling facilities to the east? )- a shared foot/cyclepath could perhaps be created here. this would, without a doubt, become popular as an alternative to get to the Pocket Park and beyond, and vice versa to the river side. Path connection Lisle Lane (opp. Springhead Lane) with Kiln Lane (exit point near rail crossing). This path is now nice and wide, and not muddy anymore, since resurfacing 1.5 years ago. BUT is still a footpath only. Perhaps we could argue/apply for upgrading this path to a bridleway or such. Of course, the gates on either side then also need replacing, allowing easy access for cyclists (and don’t forget wide enough for trailers). Perfect path for chilren to learn to cycle for first time! Similar to previous post, path connecting the eastern end of Kiln Lane with Queen Adelaide Way. Although narrow in most places, it is perfectly cyclable. However, it is a footpath only. Perhaps we could get this upgraded to a bridleway? (thus allowing cyclists as long as they give way). Connecting Lisle Lane (opp. the – now only – footpath into the Pocket Park etc – next to Peck -) with Springhead Lane.There is a stretch of some 80 m length here, relatively steep uphill, which shows some tarmac patches etc through the grass. It is used by pedestrians at the moment. I would not be surprised if there is a full tarmac path underneath most of the grass already. Would be fabulous connection to cut off the corner Lisle Lane & Prickwillow Road, and create a further cyclists’ link with the Pocket Park etc. Just to add to this information: it would need not just re-exposing of the former tarmac underneath the grass, and then resurfacing, it would also need the removal of part of the metal barrier at the bottom (Lisle Lane) end of this stretch, and replace this with a dropped kerb at this location. Connect the south-eastern (sharp) corner of The Vineyards with western end of Bell Holt. One can already walk here, but with some minor improvements it would also be cycle-friendly (signage ‘cycling allowed’ would be necessary to not anger people). would create a nice and safe cycle route from the centre SEwards and vice versa, cutting off nasty parts of Forehill and Lisle Lane. Vineyards -> Bell Holt -> past Sainsburys -> Pocket Park is my usual route and you are right that the Bell Holt bit and the short muddy bit behind Sainsburys are the bottle necks. I think the muddy bit would be very easy to improve, i.e. it just needs to have the wooden barrier removed and some gravel surface put in (tarmac would be better of course). But I can’t see a way to improve the Bell Holt part…. We may be talking about different parts in the area. The stretch I talk about does not have any muddy bits, nor is it privately owned. In the far SE corner of The Vineyards is a wide footpath (fully tarmacked) linking The vIneyards with Bell Holt already. It has got its own street name even, ‘Vineyard Way’ and is probably some 40 metres long, first (from Vineyards) NW-SE for c25 metres, then sharp corner left and another 15 metres or so W-E to connect to Bell Holt. It is wide enough as it is for pedestrians and cyclists to use as a shared path (if cyclists give way to pedestrians when needed), and as I said is tarmacked and also in good condition. Ok thanks – sounds like a good plan! Sorry I wasn’t very clear: I meant the muddy bit behind Sainsburys by the lorry entrance on the way to Pocket Park which would be quite easy to improve (which you also mention in another post). Last one for today (will add another 10 or so at another day): entry point to Waitrose car park. Not sure whether this is Highways or Waitrose-owned/responsibility. Regardless, the nasty pyramid-shaped ‘cobbles’ on the entry andd exit points are not funny! There is a token ‘cycle/ footpath’ on either side, of maybe 40 cm wide (if that). With sharp corners to tackle and cars wanting to overtake you at the same time, this is clearly not wide enough. Also, these ‘cobbles’ are an absolute horror with a trailer behind the bicycle. In addition, at the exit point, just before the token 40 cm smooth section at the edge of the cobbles, is very uneven surface cause by a tilted sewage lid. Thus one needs to cycle as a skiier to avoid both obstacles, which is difficult and dangerous with the said impatient cars wanting to overtake you at the same time. Flatten the ‘cobbles’ over a full 1 m wide on either end would be the logical solution here. The cover you refer to is an approved British Standard cover, used for many years nationwide. It is hinged and positioned in the manner it is because of the construction of the manhole. The steps to descend will be at the narrow end and the wide end is so that someone can get down into the Inspection cover. 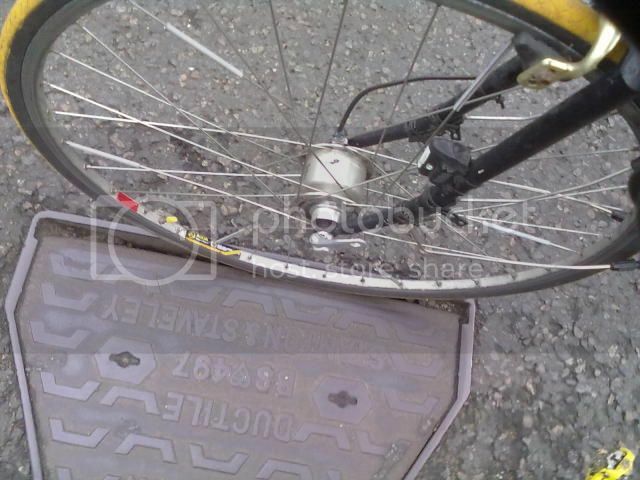 The triangular cover is not normally one used by this local highway authority, and this particular one has FW on it which indicates that it is a foul water sewer cover which is the responsibility of Anglian Water. It would be possible for them to change this to a non-hinged cover, but this is something you would need to take up with them. Their number is 08457 145 145. In the meantime, I have instructed our contractor to fill the gap at the hinge with temporary tarmac to remove the likelihood of a bike getting caught in it. Hope I have got all the paths in the right place can you check please. Silver Street: it would be good to have several small 20 repeater signs here. For cars coming from Backhill travelling through Silver Street they will only see the big 20 signs (‘Ely Porta Area’) signs just before the roundabout with Barton Road. That’s it. Living in Silver Street, I know that many cars DO speed through here, so reminding them of the 20 limit every 50 or 100 m or so (attached to one of the many street lamps) would be useful. Also, a sign at the end showing it is the end of the 20 zone is lacking – this in itself would also be useful for those people who might have thought that the 20 zone already ends after the Ely Porta! Corner Downham Road with West Fen Road: Coming from St Mary’s Street and wanting to follow the main road through Downham Road, this corner is simply an accident waiting to happen! Very VERY often I have been cut up by a car driver going into West Fen Road, overtaking me and then cutting me up directly afterwards – if a cyclist does not indicate left here, car drivers should assume that they follow the MAIN road, and thus wait behind them to go left. As an experienced cyclist, I always anticipate this possibility, but a less experienced cyclist wil one day be hurt here, or worse. 1. provide a red-painted strip of at least the mandatory 1.5 m wide on this corner, ideally starting this already from the corner with St. Mary’s, and continuing it beyond the West Fen junction. This then will make a clear visual statement, that cyclists will follow this route, and that car drivers would run into them if they would overtake them. This will also alert drivers coming from the other direction and cutting the corner quickly, that they also have to look out for cyclists. 2. Also, making the footpath wider on the south side of this junction and/or provide for a big island here would create a much narrower and sharper corner here (rather than the current oversized motorway-style entrance), so that car drivers wil naturally have to slow down to go into West Fen Road. Additional benefit: easier for pedestrians to cross – try now when you are on crutches or with a buggy! Waitrose car park: SW corner. There is a gate here which is always locked. Directly behind here is the car park/delivery yard behind Iceland etc. I suggest that this gate is opened up, providing a good pedestrian & cyclists link between this side of the shopping centre and Newnham Street. There is already a footpath between here and Newnham Street; I believe there is ample space to create a separate cycle path as well, without interfering with space needed for delivery vans etc. Added bonus: although most of Newnham street is one-way, from this point one is allowed to go both ways (one-way starts directly south from here only). On the north-east side of the bridge going over the river Great Ouse, on the A142 (Station Road) coming from Stuntney: there is a sign ‘cylists dismount’ – I do not see the need for this sign here, as the shared path alongside the road actually becomes wider right where this sign is placed! Propose to remove this sign altogether. Number 44 (end of Cresswells Lane) appears to be resolved now that they’ve surfaced the paths with woodchip. However the new barrier is incredibly difficult to negotiate with a trailer attached. Ross is the new barrier in the same location? At the end of Cresswells Lane? A very minor thing so hope ECDC might consider it. You’ve probably all seen the posters aimed at those on cycles and in cars appearing around towns. I was thinking that the “take the lane/ride central on narrow roads” poster would be helpful at the bottom of Silver Street. I’d always advise a cyclist to stay in the middle on Silver Street. There’s no safe place for a car to overtake you; they shouldn’t even try. It’s got high speed bumps and a 20mph limit for a reason – so having to follow a bike for a couple of hundred yards should be no hardship.